Posed regally above the south-central area of Yosemite National Park, skirted by Tuolumne Meadows, sits the incredible Cathedral Peak. Formed from ancient glacial activity, this beautiful and famous peak in the Cathedral Range of the Sierra Nevada is part of what is known by geologists as the Tuolumne Intrusive Suite. Cathedral Peak is the youngest of the rock formations in the Suite, being a mere 83 million years old. 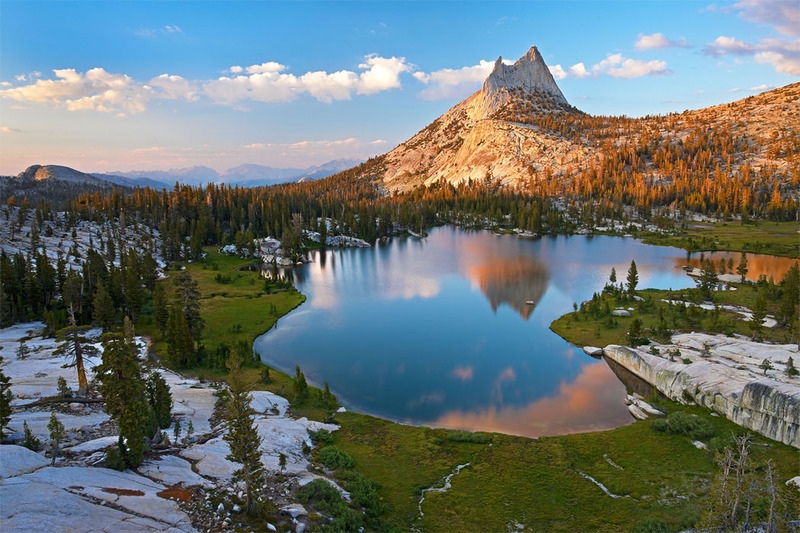 This photograph captures upper Cathedral Lake in the magnificent light of a late August sunset. The glowing Cathedral Peak is an ideal backdrop and reflection in the mirror-like surface of the lake. The photo was taken from an elevation of 9,716 feet above sea level.